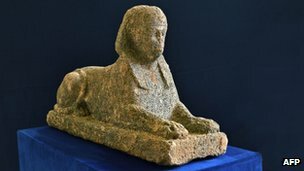 Italian police say they have recovered a stolen 2,000-year-old Egyptian sphinx near the capital Rome. They believe the granite statue was about to be taken out of the country. It was discovered boxed up in a greenhouse after police had found photographs of Egyptian artefacts during a routine search of a vehicle. Police visited the house of the driver and found the sphinx, with other artefacts thought to have been stolen from an Etruscan cemetery. The Montem Rossulum necropolis is situated near Viterbo, 100 km (60 miles) north of Rome. Rome began importing sculptures from Egypt following its conquest of the country in the 1st Century BC. Demand grew when the cult of the Egyptian goddess Isis became popular in the 1st and 2nd centuries AD.